The Patrol-D 3x42 night vision scope has a genuine design well complemented with improved optical parameters. Compact and durable rubber armored housing, long life of two AAA batteries ensuring up to 72 hours of independent operation, a diopter adjustment lever are just some features of the new Patrol-D 3x42. This monocular is designed primarily for prolonged use in motion and a wide angle of the field of view makes observation of dynamic objects really exciting. A distinctive feature of the Patrol-D 3x42 is a 1.5x booster lens (doubler) with a 42 mm front optic. 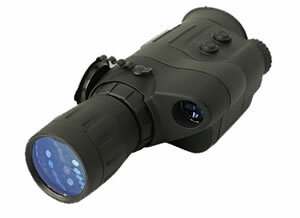 This lens provides 3x magnification and increases observation range without compromising image quality. You can remove the booster lens if necessary and use the Patrol as a 2-power unit. Thus the Patrol-D 3x42 is a two-in-one device.